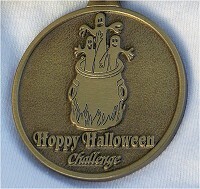 The Hoppy Halloween Challenge is open to any homebrewer from within the United States and Canada. Affiliation of entrants with American Homebrewers Association is NOT a requirement. Contestants will be considered as an individual entrant on the basis of person's name appearing on the registration form. Combinations of brewers should appear in the same order on all entries. Applicable entry fees and entry limitations shall apply. A homebrewer may not use homebrewing facilities other than their own, unless brewed with the help of the owner of those other homebrewing facilities. Furthermore, in this case, the beer must be entered under the name of all brewers who helped. Beers brewed in commercially licensed facilities, brew on premise, whether for commercial research or production, or for any other purpose, are ineligible. All entries that are shipped must received at the designated location by the entry deadline - please allow for shipping time. entry deadline, or entries that arrived broken or damaged. Each entry should be entered according to the 2015 AHA/BJCP style guidelines. Entries must be referred to by category and subcategory letter. Qualified judging of all entries is the primary goal of our event. Judges will evaluate and score each entry. Each flight will have at least one BJCP qualified judge. The Best of Show will be determined by a Blue Ribbon Panel based on a second judging of the winners of each eligible category. If the number of entries approaches 600, the competition coordinator reserves the right to close registration and cap the number of entries to maintain the integrity of the competition. Results will be announced LIVE on the Hoppy Halloween Challenge Facebook page during the Awards Banquet and then posted on the website afterwards. 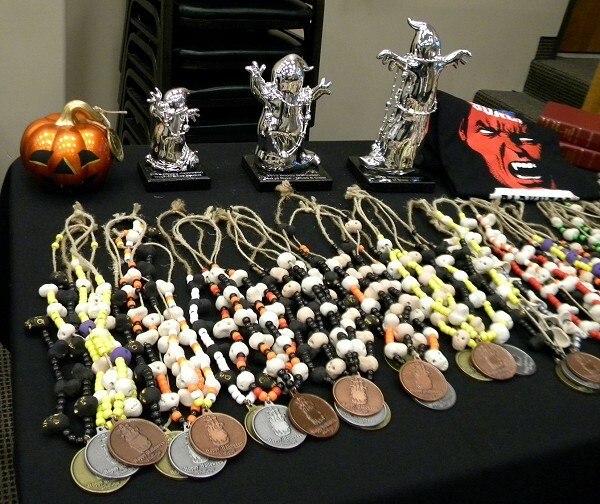 All beers placing 1st, 2nd or 3rd will win a Hoppy Halloween Challenge Medal hung from a special hand-crafted Halloween themed lanyard plus will get a prize from one or more of our sponsors. Random non-winning entries will receive 'door prizes'. Best of Show Beer and Best of Show Mead/Cider receive themed trophies and prizes. The Halloween Theme Beer and Fresh Killed Hops Beer winners will receive special awards. The Great Pumpkin Award will be given to the homebrewer with the most points in this competition from BJCP categories, accumulated as 6 points for a 1st, 3 points for a 2nd, and 1 point for a 3rd. In case of a tie, tie breakers will be determined at the discretion of the competition coordinator. Any beer with characteristics that would identify it as being made for, and in the spirit of, Halloween. 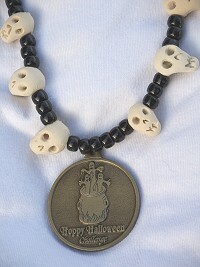 Individual qualities such as aroma, appearance, and flavor should be part of the “Halloweeness” of the entry. How spooky can you brew? A single bottle is needed for the Halloween Theme category. A wet hop beer made with fresh undried hops that displays the character of those hops in the flavor and aroma. Entry Info: Brewers should specify the base style and the variety of the wet hop used. Two bottles are needed for this category. Brewers are allowed to enter more than one beer in this category, but they must be obviously different beers.